Shabby Sparkle meets New Release Pink Christmas in July...Phew! Bonjour my little Petit Filouts! Monday morning again. Which means it's time for another double whammy post from me. Pull up a chair, grab a cup of whatever you like to sip at this time of the day (not wine, Mummy!) and get comfy, I have a lot to tell you. 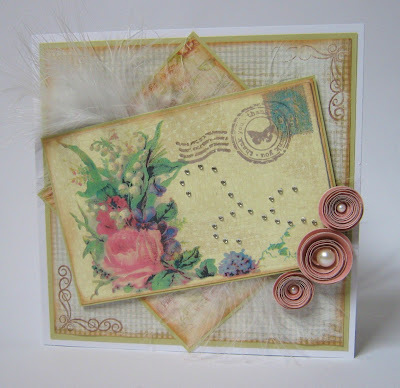 This week, Sari has chosen Shabby Sparkle over at Cupcake. And to be honest, I've been a bit worried about it. Look at this card! It is sooooooo so out of my comfort zone. But once I settled down to it, I was surprised by how into the spirit of shabby chic I got. I've dry washed all the papers with a liberal swoosh of white acrylic paint. (Very Understanding Hubby wanted to know why there was a paintbrush in the toothbrush pot the other morning. You'd think after ten years he'd be used to my (erratic) behaviour and know that in FayeWorld, it's a completely logical place to put a paintbrush you're trying to stop a Sweet Cheeks from cleaning the inside of the toilet with.) The postcard is printed onto spotty, white washed paper and then I stamped a post mark for extra shab. I've also stamped flourishes in the corners, (Sorry Delphine, I forgot to tell you about that.) one of which didn't stamp properly, but I think it just adds to the feel of the card. We're sponsored this week by Sassy Studio Designs and this is your last chance to enter to win some stash from Polka Doodles. Well, you've seen mine, pop on over to Cupcake to check out the marvellous work from the rest of The cupcakes, who will be joined by a new face (Maarit) next week. This card gave me a bit of a headache. This weeks Challenge at Pollycraft Monday is Christmas in July. You'll be very familiar with how much I struggle with Christmas cards at this time of the year and for some reason I had a complete blank with this one. Generally when I start a card I have an idea of what I'm going to do, but nuffin! It feels like there is something missing, but I have no idea what! We're sponsored by Crafty Emma's Store this time. Pop over to Pollycraft Monday for all the details and to see the fabulous cards from the rest of the Girls. You also need to head over to Tales From Pollycraft and Pollycraft Designs as Paula is releasing some scrummy new Christmas images today, Dexter the penguin is one (he has an ice cream too) and there are special offers, for today only! Papers: Colourful Christmas; MME and Candy from Mandy! your cards are sooo pretty. Beautiful and gorgeous cards hun. Love the shabby style and pink Dexter. Both cards are amazing!!! Love love love the roses you made for the first one!!! Both cards are gorgeous faye, that penguin just makes me want to smile, and I like the soft colours and the flowers on the top card. Love em both but the shabby chic one really caught my eye, beautifully done. I like the second one too, maybe slap a snowflake on it and it will feel more "christmasy". 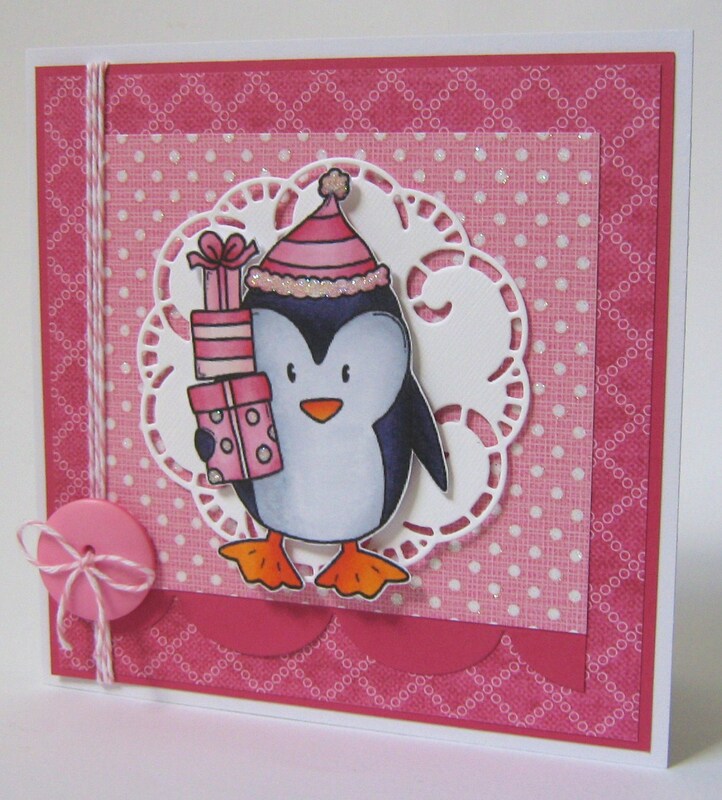 They are both fabulous Faye, your shabby card is beautiful with the washed colours and great stamping, the penguin is pure delight for my eyes, love it as it is! I'm so looking forward to next week at the Cupcakes, I'll be ready to take a pic of my project tomorrow. You would never know you're out of your comfort zone on that first card as it's beautiful! Love everything about it. And the little penguin card is so adorable. Love your out of your comfort zone vintage card...I'm proud of you....your 2nd card is a sweetie...it is good as it is...the only embellies I could imagine are some snowflakes?????? 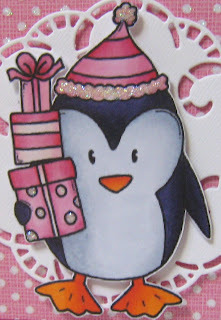 Very classy card this week Faye love the shabby look and adore your christmas card I have a soft spot for penguins and these are defintely cute. Oooh hun they both so gorgeous ...I love them...! two very different cards Faye but I like them both the penquin is so cute and cherry and the shabby chic is just that. Firstly can I just point out that I am not on the wine! It tastes discusting with the liberal amounts of nasty medicine 'The Doc' is pouring down my throat at the moment. Secondly I just luv the shabby chic look. Did you colour the flowers too you clever thing! Both beautiful cards Faye! I love the feathers on the first one and your pink Dexter card is just perfect! Faye, these are both so GORGEOUS!!! Adore the PC one most of all of course, lol!! A lovely shabby sparkly card Fluff. First of all, shabby chic may not be your forte (so you say!! ), but you rocked it! Love, love, love the papers and gorgeous design. The flowers are perfect with the rose centers. Love the dotty pinks on the Christmas penguin! Too stinkin' cute! Totally awesome cards Faye...I love the shabby chic, you did a fab job on it. Couldnt tell it was out of your comfort zone :) The penguin is sooo cute and that pretty white die cut behind really makes him pop! love the winter card and the fresh and shining colours! Lovely cards!! The first one is perfect shabby and sparkly. The penguin in the second one is too cute!! Hi Faye - I think your shabby is wonderful. Where did you get that lovely postcard from? My computer just crashed whilst I was trying to comment. I hate that bluescreen moment when one's life (or at least the part of one's life stored on the pooter looks like it might dump itself into the ether). I think it's okay now.